Thursday night's 'Legends of Tomorrow' left the team stranded in Star City except it was 2046. So naturally when they come across a shadowy hooded archer they assumed it was Oliver Queen. To their surprised it was one pissed off Connor Hawke. The action-packed trailer shows a Star City in ruins, Sara is devasted, Rory is thrilled, Deathstroke emerges and so does a much older Ollie. Stephen Amell sports the iconic goatee of the comic book Green Arrow and shared a still photo (below) and a couple more on his Twitter page. Ollie will also share other characteristics from the comics. In the television version, Hawke won't be Ollie's son who takes the mantle from him as in the comics but is a different version as Guggenheim stated. Joseph David-Jones (The Divergent Series: Allegiant) is playing the CW's Hawke. 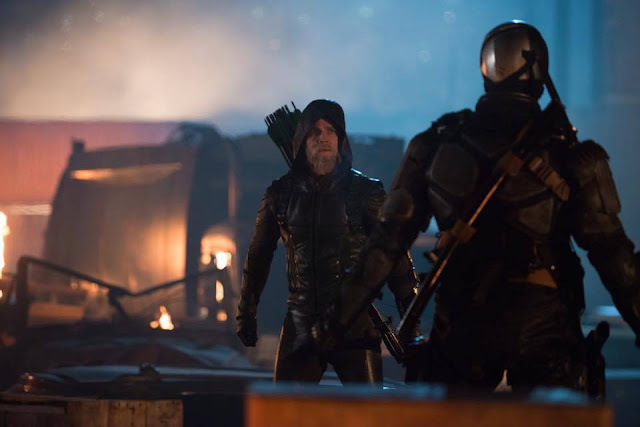 Deathstroke makes an appearance as the highlighted baddie but is it Slade Wilson? DC’s Legends of Tomorrow airs Thursdays at 8 p.m. ET on The CW. THE TEAM ENCOUNTERS A VERY DIFFERENT OLIVER QUEEN – When a malfunction sends the Waverider crashing into 2046 Star City, our heroes face a startling version of their own future where they never stop Savage (guest star Casper Crump) and never return home. The city is in ruins and overrun by criminals, which thrills Rory (Dominic Purcell). Sara (Caity Lotz) is despondent over the destruction of her home and stunned when she learns what happened to her old friend, Oliver Queen (guest star Stephen Amell). Steve Shill directed the episode written by Marc Guggenheim & Ray Utarnachitt (#106). Original airdate 2/25/16. Welcome back to Star City. A new DC's Legends of Tomorrow is Thursday at 8/7c.